Today MRN is hosting the book tour for THE HUNTED SERIES by Ivy Smoak presented by Mark My Words Book Publicity. Get the deets on the book, read my review, and add it to your TBR lists. Follow along on the tour until September 18, 2015. Indulge in the temptation in the breakout series The Hunted by Ivy Smoak. When Penny Taylor runs into a handsome stranger in a coffee shop, she believes her luck has finally changed. After having her confidence unwound by her ex, she falls hard for a true gentleman. But once she realizes that her crush is her communications professor, her world is turned upside down. What is a girl to do when she finds out that her Communications professor is also her new crush? Part 2 picks up right after their first rendezvous and that’s when I couldn’t put this book down. Although Penny and Professor Hunter decided to embark on a relationship at this point, the tension continues to grow between them. The elusive Professor Hunter has secrets that he holds very close. Penny can’t seem to resist Professor Hunter’s sexiness long enough to ask the hard questions and when she finds out what his secret is, she does what any 19 year old does! She runs away without confronting Professor Hunter and asking him for an explanation. 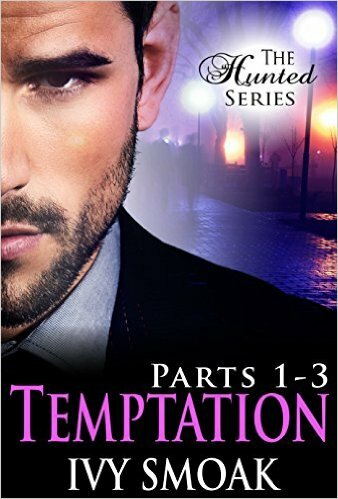 Overall, Temptation, Parts 1-3 is not what I’d call romantic — I had trouble believing what made either Penny or Professor Hunter fall in love with each other beyond their carnal attraction. Yet the tension, angst and suspense surrounding Professor Hunter kept me fully engaged in this wild ride!! For that, I will continue with this serial to find out what happens next for Penny and Professor Hunter. I plan to do that…I’ve been crazy busy the last few days but I will post on Amazon and GR before the weekend.